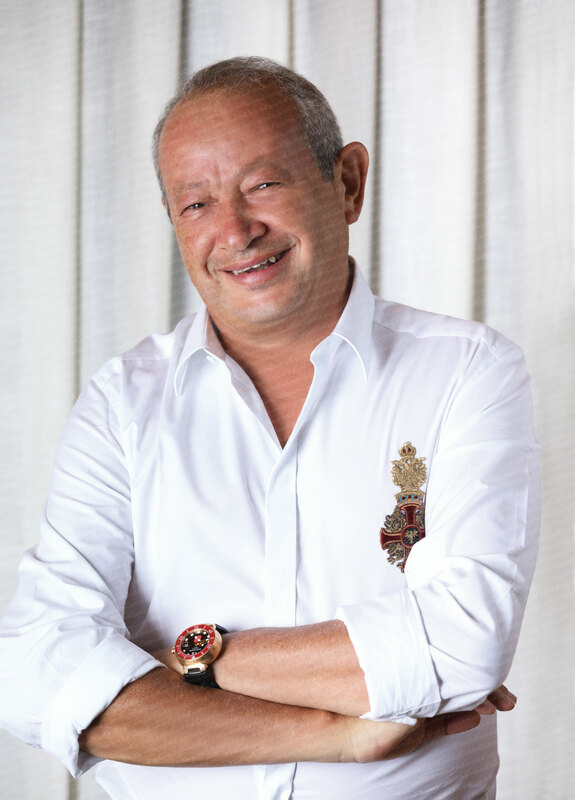 Naguib Sawiris is a man of many contractions. He is a billionaire, yet a man of the people. He is strong and determined, yet sensitive. He is very jet set and could live anywhere in the world, yet he prefers Egypt. He is serious and hard working, yet he loves a good party. He is very loyal, yet those who cross him are rarely forgiven. He is extremely busy, yet always makes time for people or causes he cares about. But, most importantly, he is fearless, determined and outspoken. He is a rebel with many causes and a pioneer in so many of the huge projects he has undertaken. He has faced many challenges in his life, but he perseveres as he rarely takes ‘No’ for an answer. I had the privilege to interview Naguib several times over the years and it was in this interview that I found he was most at peace with his life, his accomplishments and the state of the country. On a calm Gouna night, the day before the closing of his passion project, the first edition of El Gouna Film Festival, I sat down to discuss his vision for this amazing week-long event and how once again, despite the challenges, he turned his dream into reality. 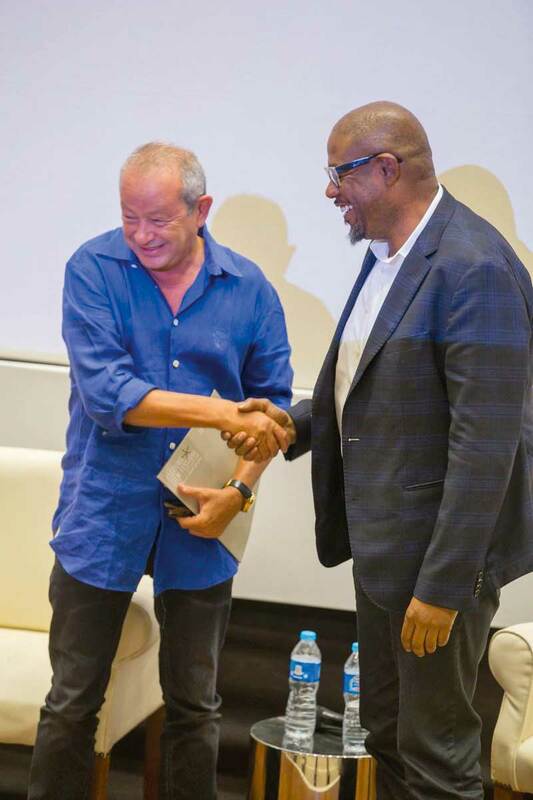 Read on to discover more about the true enigma that is Naguib Sawiris and how, due to his hands on involement, he turned the first El Gouna Film Festival into a huge success…. Naguib, you are known to be a pioneer in so many fields and a successful entrepreneur and now you are the founder of El Gouna Film Festival. With so many projects under your belt, what inspired you to create this festival? I was always a movie lover; addicted to movies and cinema. I have a long history with cinema; twenty years ago, I started building a lot of theatres, as it is one of my passions. I usually watch a movie when I go home. And if I go to a boring party, I skip the party and go home and watch a movie. I love movies, so that was the main reason. And Egypt is the leading country in Arabic movies. The entire Arab world used to look up to us because of our movies and our stars. So the idea came to me, that I should help and reward this industry by doing a film festival out of Egypt, that is managed, initiated and financed by the private sector, with no government involvement. I knew this way we could really do what we wanted, as there is a lot of bureaucracy with a government run festival. The second reason is I wanted to reward my brother because he has done a magnificent job with this city. El Gouna is the most beautiful city in Egypt in my opinion, and I wanted to give it a push. I wanted El Gouna to become what it deserves to become, because it is a city of international quality. This festival will put El Gouna in a different league. Many people didn’t know about El Gouna before and they came for the first time because of the festival. All the international artists who came for our festival will be the best ambassadors for us later on when they speak about El Gouna and their experience here. The third reason I did this festival was because we need to fight all these vicious forces that try to disrupt our tourism industry with violence or terror. And there is no better way to fight them than with music and movies and the cultural elements that bring the world together. This festival will help restore tourism to Egypt because it will show that Egypt is safe and that we can organise a big international event with no incidents. It will attract tourists to look at Egypt again and highlight our country in a positive manner in the news. So far, the festival has run very smoothly. Was it organised by an international company or an Egyptian one? It has all been done by a young Egyptian crew, Amr Mansi, Bushra and Kamal Zadeh; these are the three pioneers. And of course, the manager and chief editor of the festival, Mr. Intishal Al Timimi, who has done a great job. He organised all the workshops, selected all the movies, the committees, the judges and all the people from the industry that were invited. He deserves a lot of credit too. When you were inviting the foreign press and foreign celebrities, did you face any challenges? Yes, it wasn’t easy, because of their fear of terrorism. But I reminded them of the recent terrorist incidents in Europe. I would tell them, you can be walking in London and some crazy guy can come at you with a car and kill you or in Paris you can be sitting in a restaurant and terrorists can come and shoot you. So, at least in Egypt we’re equipped and prepared because we have become used to these kinds of acts. Is there anybody that you really wanted to attend and wasn’t here this year? I didn’t invite Robert Di Niro this year. If I had the choice, he would be the actor I would most want to attend. I’m supposed to have lunch with him this winter so I will extend an invitation to him. He’s like my hero. I know you have been involved in the Cairo Film Festival in the past, has this been a different experience for you? It is a completely different project because in the Cairo Film Festival, we are just sponsors so we are not engaged in the management of the festival itself. It is run by a semi-government management team, who try to do their best. But they don’t have a lot of resources, and they are bound by the bureaucracy and how to spend their budget. They are also subject to interference from many players. El Gouna, on the other hand, is a free space, so it’s much easier. And since we come from the private sector, we can spend the way we want and utilise the talents the way we want; which is a completely different story. But I will support the Cairo Film Festival, because if you love movies you will help anyone involved in anything that helps the movie industry. We did not do this for fame and glory, we did it for very clear objectives. We did this to benefit our country, and it’s the same for the Cairo Film Festival. So I intend to support the Cairo Film Festival this year as well. Was the idea of the El Gouna film Festival inspired by another film festival around the world that you had attended? No, no. It was just because El Gouna is a beautiful spot and we’re in control here. There are no external elements that could spoil things. We administer this city, so we are free. And it’s a free and beautiful environment where we can expand easily. For example, if this year we decided to build three theatres, next year we can build ten if we wanted to. So how many screens do you have in El Gouna now ? We have a total of five screens now. One in the German Technical University, another open air screen which will remain, and Sea Cinema one, two and tree. This being the first festival, what would you say was the biggest challenge? The biggest challenge was that we didn’t have the experience to do a film festival! We had to learn everything from scratch, so it’s actually amazing that there were no fatal mistakes. We will do a SWAT analysis after the event to see what we could have done better, but frankly there were no big mistakes. But still, this was a big challenge, as we did not do it before. The second challenge was that many people abroad don’t know El Gouna, so when you invite people, they say, “who is Sawiris? And what is El Gouna? Who is this guy trying to make a film festival?” They take you lightly. They don’t know that we have a track record and we only do things the right way, and that we will never put our reputation in jeopardy. We have to do things successfully. Well, your name is pretty international. Yes, it helps but not everybody knows me in the end. 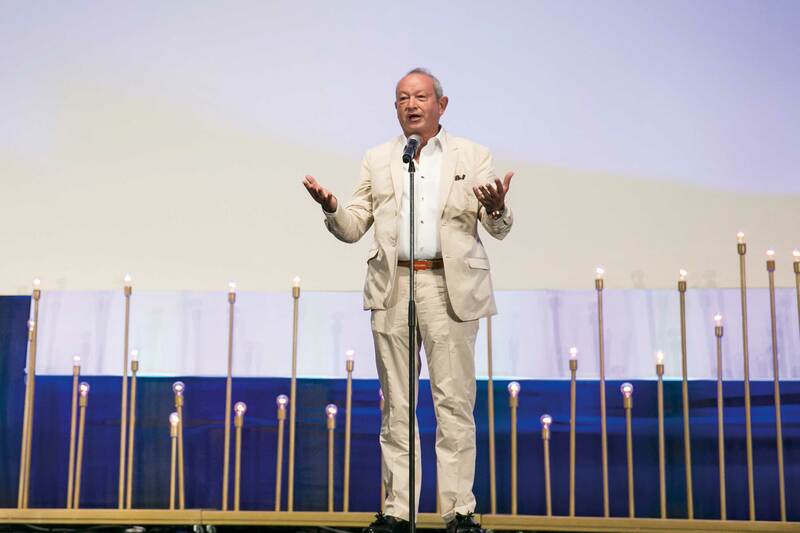 Another challenge, frankly, was that it was tough working with my brother, as we don’t always get along (Sawiris laughs). In personal things and in business (he laughs). My father was wise when he said each brother should handle his business on his own. It’s challenging because we never worked together before and we don’t have the same character. Was he as involved as you are in this project? So how would you tackle this challenge next year? I don’t think he expected the festival to have so much impact and success, and so I think he will be more cooperative next time. I hope so! On the bright side, what do you think was the highlight this year and what has made you happiest so far? The after parties… Each and every one. Every day there was an amazing after party. I never enjoyed El Gouna like that before. I went to bed every day at 6 AM! There were many. The opening after party was massive, with maybe 3,000 people. After that, every day there were people having parties in their homes or at Pier 88 or at Aurora. The town was on fire. I was also intrigued to watch all the short movies during the festival. They were amazing! The first two. But, I am trying to buy all of the short movies. They are all amazing movies and because our theme was “Cinema For Humanity,” most of the movies were really touching on the human level. You initiated a partnership with the actor Forest Whitaker during the festival; can you tell us about that? Yes, I recently discovered he is involved in South Sudan and I have a soft spot for Sudan, North and South. I used to know Dr. Garang, the liberator of South Sudan. He was a charming man, like an angel. He did not want separation, he wanted the unity of Sudan, but with equal rights. I visited him where he was born and in his camp. And I also worked in North Sudan in Khartoum. So when I came to know Forest, I told him I wanted to help his Whitaker Peace & Development Initiative, so I am now supporting his organisation. And I invited him to the film festival and he graciously accepted the invitation. He is such a kind and passionate man. I also heard that Oliver Stone is here. Yes, he is. He had a workshop and we aired his interview with Putin on ONTV. It’s a four-hour interview, which is really fascinating. So thankfully we have these important people attending. Yes, we also had the actors, Dylan McDermott and Michael Madsen at the festival. After this experience, what is your main goal for the festival next year and in the future? We have to improve every year. We have to get accreditation and invite more international personalities. And the more we do that, the more this festival will be ranked among the best in the world. We want to become one of the best international film festivals. I never stop until I reach the ceiling. I have a long history with cinema. We have everything we need here. And now, we have credibility after this event, so why should we fail next year? Does this festival mark a new foray for you into the film industry? I already produce movies. I produced the movies, Maulana and Rayhin Fe Dahya (We’re Doomed). I am also producing another movie for Ibrahim Eissa called, The Guest. It’s an amazing story. And I am also going to co-invest in another movie. What we also achieved with the festival was making deals. Would you now invest in Hollywood movies as well? I would rather invest in my own culture and my own industry. The movie industry is a risky business. I want to take it slow, because the more you take on, the more you need to work. Even here with the festival, I needed to work a lot. But this is something you were passionate about and you wanted it to be hands-on? Yes, creating this festival was a project I was personally passionate about. It’s like when I established my own beautiful night spots, because I wanted to have places of a high standard that I could go to and enjoy. And so it’s the same thing for the festival, and I did enjoy it!